Enjoy this True Blue Raspberry Sherbet for a light and refreshing treat that the whole family will love! It is dairy free, gluten free and has just 6 ingredients. If you follow a dairy-free diet or are just trying to eat less dairy, I have a treat for you today. 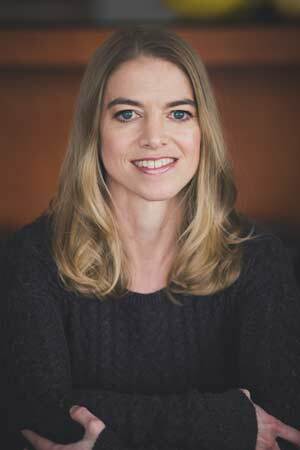 I am excited to be sharing the launch of my friend Alisa Fleming’s latest book with you! Eat Dairy Free is THE resource you need to follow a dairy-free lifestyle. 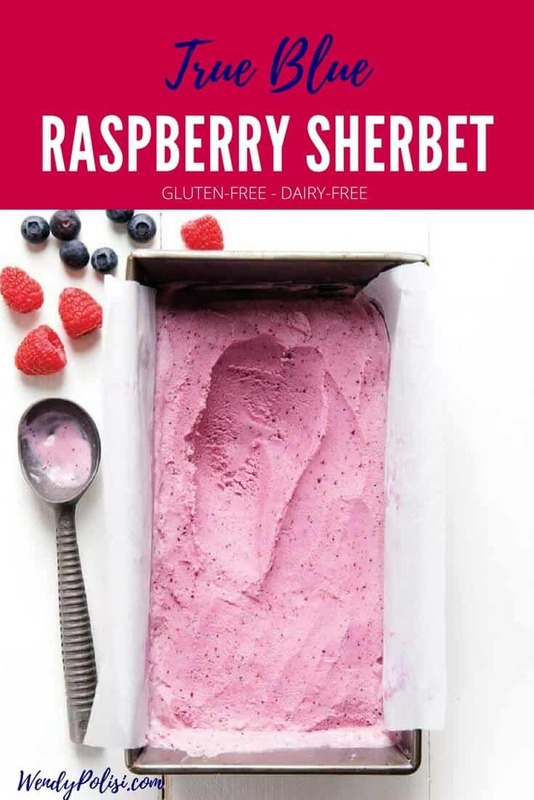 This beautiful book has 110 delicious recipes (including this True Blue Raspberry Sherbet), all of which have thoroughly tested options for Gluten-Free, Egg-Free, Peanut-Free, and Soy-Free. Vegan? No problem! Eighty-four of the recipes are vegan, and half of those that aren’t vegan could be made with vegan meat alternatives. One look at the beautiful full-color photos and you will realize that a dairy-free lifestyle does not have to mean sacrifice! I love that the book focuses on real food. There are no store-bought dairy substitutes needed. This means that you don’t need to go to three different stores to hunt for dairy-free cheese, sour cream or other specialty alternatives. Alisa has even included a super-easy recipe for homemade milk beverage. Adopting a new way of eating can be a daunting task, and it is so easy to get overwhelmed. Alisa has your back with her approachable, everyday recipes that will keep your body nourished and appetite satisfied. As a busy mom, I appreciate both the fast and easy recipes and the make-ahead options. Special bonuses include menu plans, ingredient primer, and quick reference allergen / special diet charts preceding each chapter. …I could go on, but you get the idea! 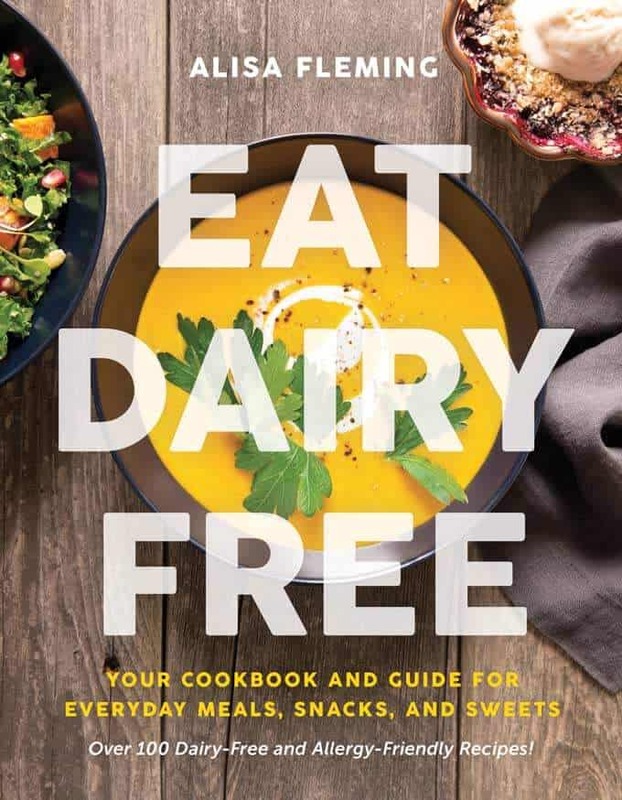 Whether you are dairy-free or just interested in eating healthy, you are going to want to check out Eat Dairy Free! Buy Eat Dairy Free on Amazon! Put the berries, puree, coconut milk or cream, sugar, lemon juice, and gum (if using) in your blender and blend until smooth. Refrigerate the berry mixture for at least 1 hour. Ensure that you have frozen the insert for your ice cream maker for at least 24 hours, if directed in the manufacturer’s instructions. 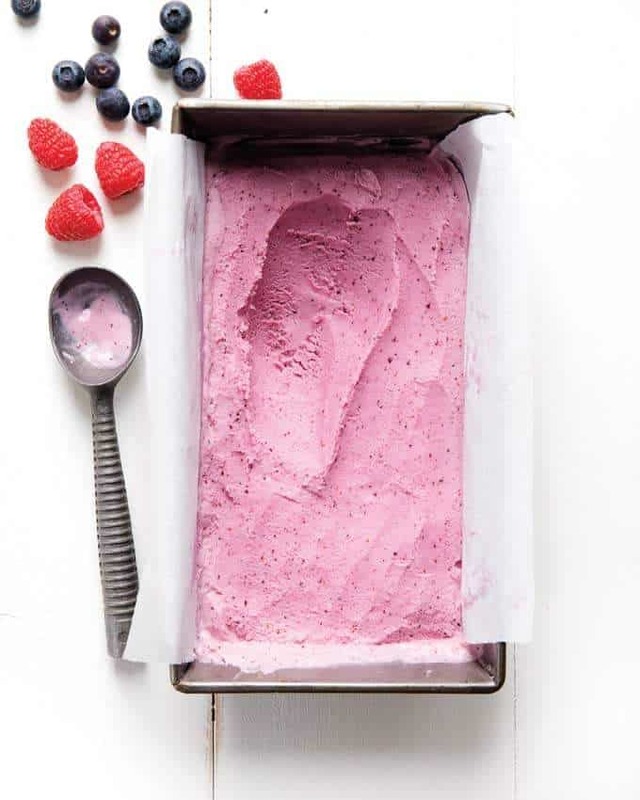 Churn the berry mixture in your ice cream maker according to the manufacturer’s instructions. 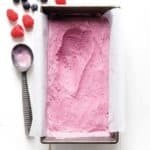 Pack the soft sherbet into a freezer-safe container and freeze for several hours or overnight for hard-packed ice cream. If it becomes too solid, let it sit at room temperature for 10 minutes before scooping. Looks fabulous, Wendy! Can’t wait to try this one. This sounds like such a yummy and reasonably healthy treat! I have a few people in my family who are dairy-free so I’ll have to try making this for them. Oh my goodness this sounds like it would be right up my street! I bet the mix of flavours is just wonderful, I think I might have to make some this weekend! That sherbet looks positively fabulous – in fact every recipe I’ve seen so far from Alisa’s book does! Well this just made it’s way to the top of my list of must tries. I am going to have to make this asap for the kids and I. This looks so delicious. I am going to have to make this for my family. I Love that it is healthy too. Thank you for sharing my book and this recipe Wendy!! I need that book! I’m a vegetarian, bordering on vegan. My hang-up has always been dessert. So this sherbet is a perfect fit. Plus, the rest of the cookbook sounds awesome. That sherbet looks absolutely divine, certainly a treat all the family would be able to enjoy.